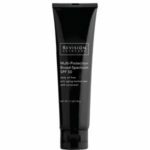 Multi-Protection Broad-Spectrum SPF 50 is a daily moisture with sunscreen for all skin types. Keep skin protected every day with this lightweight, oil-free, anti-aging moisturizer. Formulated with three peptides and potent antioxidants to brighten your skin. Contains a strong blend of antioxidants.